I watched an obscene number of films over New Year, but ask me to name them and I'm wracking my brain. 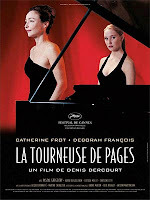 The penultimate one was La Tourneuse de Pages with Catherine Frot - a French film about revenge. Revenge served cold after exquisite planning and meticulous execution. Added to that was a lovely score of music - Catherine Frot plays a professional pianist, a magnificent country manor with indoor basement pool set 40km from Paris, and a delicious suspense throughout. The one after that was L'Ivresse du Pouvoir which I didn't really understand. It was another French film - we'd run out of foreign action/thrillers by then - which was very much inspired by the Elf Affair. Isabelle Huppart plays a Juge d'Instruction who goes after big business corruption, abuse and political influence. A bit lacking in action... I sat through it as it sailed over my head. I'm now in deep water trying to remember what else we saw. I know I have a bad memory but this is fairly recent history, and it's not like 'you seen one film, you seen them all' as they were all different. Come to think of it, many were not very good which is maybe why I'm having such difficulty remembering their titles. I was going through a real 'chill in front of the tele' mode - didn't want to go to Nice, didn't want to go out, just wanted to plant myself on my lovely comfy sofa, heating on, and wallow in front of the tele. Preferably with my TWDB. Must be a mid-winter thing - it saps the energy, especially after the excitement of Christmas, travel and accompanying organisation. It's no good, my memory is still a blank. I haven't even been able to shock myself into memory recovery, or shame my lazy brain cells into activity. No, they are all, themselves, sitting with their feet up watching tele in the cosy recesses of my skull. Try to stir things up a bit and they're out on strike threatening to wipe out the rather delicious memories of New Year's Eve and provoking flashbacks of my divorce years. The buggers. So, while I would love to share with you my film reviews of the last week of 2009, I'm afraid that's all you're gonna get. The rest left no obvious mark on my conscious mind, so that rather puts them in their place, n'est-ce pas. The next time we decide to rent a film, we're going to try and find one from the Le Point list which includes Benjamin Button, LOL, La Première Etoile, Neuilly Sa Mère, Very Bad Trip, Un Prophète, Slumdog Millionaire, Welcome, Irène etc. I may even remember enough to write a review of the less obvious ones. Yeah.